I have just returned from a science fictional weekend spent attending various panels at Capclave up in Gaithersberg, Maryland (a post on this is forthcoming). It’s always fun to attend conventions because you get to talk with people who breath the same kind of air that you breath. And you can talk about old stories, like the stories that appear in this issue of Astounding, and count on at least a few people having read the stories. If you didn’t see the earlier announcement, these Vacation posts are now being reprinted from the beginning over at Amazing Stories.com. The episodes are coming out every other week, alternating with the appearance of the new episodes. Episode 1 appeared over there last Monday. It’s nice to get the additional exposure for these posts. Hopefully it means that more people can enjoy them. And apparently, there are people out there that are enjoying them. I am starting to hear more and more from people who read these posts and write to tell me how much they enjoy them. That’s always nice to hear. I read this and it sounded familiar–and that’s when it dawned on me: what Campbell describes above is, I believe, the principle behind a turbojet. Except this principle did not yet have a name! Pretty cool! Blurb: A tale of an epic exodus, when the long-lived members of the Families fled the hatred of the normal people of all Earth. First of three parts. 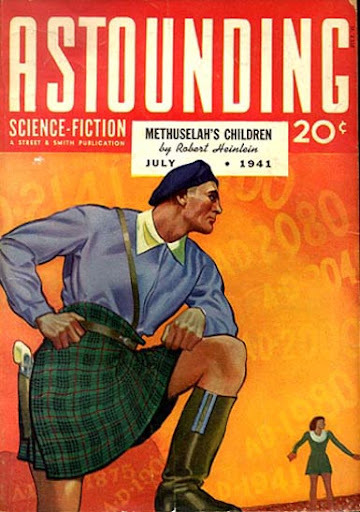 I believe that I first read Methuselah’s Children in 1997–it was included in Heinlein’s The Past Through Tomorrow and while I read it there, I have little memory of the story. But so far, I’m enjoying it this second time around. The story, of course, is an integral part of Heinlein’s Future History and for the first time, we see some characters we’ve seen before… and we are introduced to Lazarus Long, perhaps the most important character of Heinlein’s entire series. Methuselah’s Children is the story of an extended family of long-lived people. Their long lives are due entirely to breeding, but the world at large, who has only recently discovered their existence, is certain that there is some special trick or treatment for long life–and that the Families are keeping it to themselves. Because of this, they are persecuted by the government at large. Known members of the Families are taken into custody and information is extracted from them, seeking both other members, but also the secret to their fountain of youth. Heinlein nails this aspect of the story. Of course, persecution of one group or another is a theme that runs through his Future History, but what I found striking is the fact that people want to believe in something, whether or not it is there. In this case, they want to believe that the secret to a long life is available to them, even though there is not secret. Heinlein’s example here is an analogy for much of the way our society behaves. People believe there is some secret to getting rich quick; or to losing weight fast. Heck, there are new writers out there who believe there is some secret to getting published, despite nearly every published author telling them there isn’t: that it takes a lot of hard work and some luck. Heinlein’s metaphor resonates brilliantly throughout the story. While I think Heinlein is showing signs of moving to the next level with this story, there are still elements he seems to cling to, like historical info-dumps as embedded dialog. He makes these interesting, and perhaps for a contemporary reader, they were more acceptable then they are today. And despite some progressive politics, there are clear signs that women were still seen as second-class citizens in this society. Mary Risling had 27 children, for instance. And one solution offered to the problem of sharing longevity with the public as large was to offer the women of the world “germ plasm” from the Family men. That said, the first part of the story is told from Mary Risling’s point of view, and I believe it is the first time Heinlein has used a female protagonist. It was too bad she disappeared halfway through the story. Hopefully she will be back. A preoccupation of the electorate on any one issue to the exclusion of all others has always had, historically, the effect of corrupting civic morals; public representatives of broad viewpoint, mature wisdom, and judicial temperament are displaced by fanatics and by scalawags willing to beat the drum for the popular issue–little men. After discussing options with the Administrator of the Western government–who actually believes that there is no secret to longevity, but still thinks that everyone else does–the solution at hand begins to circle around isolation. The Families will take a ship to the stars. Is it even possible? This is where part 1 ends and we’ll find out more in Part 2. But I have to say that so far, this is one of my Heinlein favorites. This latest story by Clifford D. Simak carries on the theme of “Methuselah’s Children”: longevity. This time, the story is a kind of boiler-plate detective story involving a mysterious sandy powder that turns out to be stuff that will make people young again. The story unfolds when the narrator, a newsman, runs into Old Eli, a fellow who is rumored to be very old, in a bar on Mercury. Eli has a tale to tell him and has some powder to show up. Eventually, Eli ends up dead. Meanwhile, the narrator, Sherman, is asked to take a package back to Earth with him. He is told that the package contains nothing more than a tourist gift, a spaceship made of sand inside a bottle. When his curiosity gets the best of him, Sherm opens the package and discovers to his surprise that is exactly what is inside the package: a spaceship in a flask. Of course, we later learn through various permutations that the sand is actually the powder that gives long life. There are various machinations and manipulations before the truth comes out, but overall, this was an entertaining murder mystery wrapped in a science fiction story. What I find interesting about that fact is that Campbell was outspoken in his belief that you couldn’t mix and match mysteries and science fiction because some gadget could always been invented to help the detective solve the crime. That certainly wasn’t the case here–this was a straight-forward detective story. But we are also still early enough into Campbell’s stint as editor that his opinion of the mating of science fiction and mystery may not yet have solidified. Isaac Asimov said frequently that his clear and unadorned writing style came by mimicking Clifford Simak and though we’ve seen a few Simak stories already on this Vacation, this is the first one where I can begin to see that is true. Reading the story, I felt like I was reading an Asimovian story, but really I had it backward. Asimov was attempting, in his fiction, to imitate Simak, not the other way around. We have seen quite a few stories from van Vogt in this Vacation. He kicked off the Vacation with “Black Destroyer” (July 1939, Episode 1) and for a while followed a theme of beast-like aliens tormenting explorers. He hit a high note with fans and editor alike with his serialized novel, “Slan” a work completely different from his previous stories. With “The Seesaw” van Vogt once again shifts gears into new territory, something unlike anything he’d previously attempted in the pages of Astounding. The story is about the appearance of a mysterious weapons shop and what journalist C. J. (Chris) McAllister discovers upon going inside. In a preamble to the story, we learn that McAllister disappears and is never heard from again. What we learn, from McAllister’s view point, is that this weapon shop is from the far future. They think he is someone else, and when he enters he builds up a certain amount of energy that makes him dangerous to everyone around him. The people in the weapons shop attempt to trick him into going back, using him as a kind of lever to bleed off the excess energy he built up. But this has risks. Eventually, McAllister does go back, but finds that he is caught in a kind of ever increasing pendulum of time, swinging into the future and then into the more distant past, again, and again and again, perhaps forever. “The Seesaw” is the first of what will become known as van Vogt’s “Weapon Shop” stories. (I wasn’t aware of this until a few of my correspondents pointed this out to me. And truth be told, I may not have picked up on it without their aid, as I have not read van Vogt beyond what we’ve seen in this Vacation.) I liked the story because it was something different, not what I’d come to expect from van Vogt, for the most part. There were several interesting facets to the story. van Vogt does a good job of making the weapon shop seem an abode of highly advanced technology. It is supposed to come from 5000 years in the future, and Clarke’s oft-quoted law regarding magic applies aptly in the case of this story. Mirrors appear out of nowhere and people seem to walk through walls. It seems like magic, but it is just startlingly advanced technology. Then, too, something in the back of my mind, as I read the descriptions of the inside of the weapon shop reminded me of descriptions I’d read in Clive Barker’s Imajica. I read the novel only once, in 1992 or 1993 and I recall little of it, but it was brought sharply to mind as I read van Vogt’s story. Mystical descriptions like these can be a little off-putting, but in this case, I took it to be a mechanism for van Vogt to provide an attempt at describing something we simply cannot comprehend. He discovered that he was lighting a cigarette; and abruptly realized that that was what he needed most. The first puff tingled deliciously along his nerves. His mind grew calm; his eyes played thoughtfully over the faces before him. One can almost picture van Vogt doing the same as he sat before his typewriter, working away at the scene. All told, I enjoyed the story, I thought van Vogt carried it out well, but I will say that it did not really read like an Astounding story but seemed more like something that would belong in Unknown. Then, too, I wasn’t clear as to the actual purpose of the weapon shop, but perhaps that will become clear in future episodes. The story was included in the Asimov/Greenberg retrospective for 1941. “The Probable Man” marks Alfred Bester’s first appearance in this Vacation and his first appearance in Astounding. He had published a few stories in Thrilling Wonder prior to placing this one. Bester is another of those writers who began a giant in the field, and the story that starts him out is a pretty good take on time travel. This is the story of David Conn, a “correspondent” from 1,000 years in the future, sent back to 1941 to report on conditions in that time. The story opens with Conn (who has been in 1941 for a year) and his girl, Hilda, being chased by Nazis. Conn is trying to get back to his time machine in time to make it back home, but he has some regrets. He has fallen in love with Hilda and doesn’t want to leave her behind. But he does leave her behind, after a brief gun battle with the enemy, and takes his time machine forward 1,000 years into the future, just in the nick of time. Only, the future is no the one that Conn recalls. In his future, Earth was one world-girdling city. This one seems rather desolate. He quickly encounters two warring peoples, the Swasts and the Readers and after some initial confusion (killing 6 of their men) falls in with the Readers. “The Probable Man” is all about Conn’s efforts to get back home, without really understanding where “home” is. It takes the old adage, “You can never go back home” to a new level. Through some complicated logic, the Readers (who are supposedly excellent theorists), demonstrate that once sent back in time, a person could never return to the future he or she left, but instead, would return to an alternate or parallel future. Conn’s only real choice is to head back to 1941, which is where he really wants to go anyway, since he discovers how much he really loves Hilda. But he can’t do this until he helps the Readers (free thinkers) in their war against the Swasts (Nazis). They hustled Conn down the left tunnel at a brisk pace. Gradually it dipped lower, widened and deepened until it was an enormous thoroughfare. Other tunnels continually entered it. Conn felt like a blood corpuscle taking a sight-seeing trip through a venous system. I love that last sentence. It conveyed they trust of what Bester was getting at clearly and viscerally. Eventually, through the help of old technology, Conn helps the Readers defeat the Swasts and manages to get back to his time machine and jump back to 1941 where, in a scene remarkably similar to the scene toward the end of the first Back to the Future film, he watches himself and Hilda escape from the Nazis–aiding them out in the process–and then rejoins her to live happily ever after. This was an entertaining story that did more than entertain. It posed the question of what it meant to be home, but it also took a more rigorous look at the traditional time travel paradoxes and turned them on their head slightly. Where the past affects the future, here it was argued that the future affects the past. The presences of the Nazis throughout the story convey some of the angst that had to be felt in the United States by mid-1941, and an expression of the fear that they might not, in the end, be defeated. In the case of “The Probable Man” they were defeated, but to Bester’s own point, we only see their defeat in two of an infinite number of alternate time tracks. In still an infinite number more they went on undefeated. Blurb: How the asteroids got their names–and not the names of Greek and Roman gods and goddesses. They’re named for pet dogs, girl friends, telescope donors, or anything handy! Every year the Greenwich Observatory publishes in the Monthly Notices of the Royal Society a progress report on minor planets that reads like a combination of Vital Statistics and Personals in the daily paper. One learns, for example, that 188 asteroids were discovered during the past year of which 171 are believed to be new. Members of the Society will be glad to hear that 1940 UQ has been identified with Alabaster, missing for the last six years. Following are asteroids whose orbits have been officially approved and admitted for publication in the Kleine Planeten. Below are those that have received names. They regret to announce that 37 asteroids have gotten lost. Richardson goes on to describe some interesting facets of the orbits of asteroids, including the Trojan asteroids around Jupiter and the inference that there may be similarly positioned asteroids in Trojan orbits around the Earth-Moon system. He refers to the Trojan orbits as the one known solution to the three-body problem, and then goes on to talk about other orbits and the origins of the asteroids themselves. This was a fun and entertaining article, and one that had valuable astronomical information from the time. I think the key to articles like these is that they provide a window into the scientist’s world, which is exactly what Campbell is looking for. Campbell wants scientists to be portrayed realistically in stories, and what better way than to have scientists describe their processes. Blurb: As a businessman, Johnny Day may have been a lamb among wolves–but he could make geometry do tricks! There is a theme I’ve noticed that runs beneath the surface of a number of the stories that have peared in this Vacation. It comes in the guise of romance, but with the twist that the hero of the story is always trying to gain parental approval of his affections for some young lady. We last encountered this (if memory serves) in L. Sprague de Camp’s serial “The Stolen Dormouse”. That theme runs beneath this current story by Nelson S. Bond. Johnny Day is a mathematician looking for a job and, as it turns out, to marry Peggy MacDonald, daughter of the boss of the Northern Bridge Steel and Girder Company. (The story opens: “Old MacDonald had a firm.”) Old Man MacDonald prides himself on efficiency and the young Johnny Day is to demonstrate one thing in the office that could be made more efficiently. He eventually demonstrates that the cord for the lamp could be 2 feet shorter if it was set up in a nonconventional (but unobtrusive) way. While interesting, this slows the story a bit as the first few pages of an already short story are spent describing this phenomenon. And in case it isn’t clear from the exposition, four diagrams are included in the text to show visually so that the reader gets it. This story is nothing more than a demonstration of a couple of interesting geometric principles with a story bent around them. While the geometric principles are interesting, in this case, I think they would have been better handled in an equal length article. Blurb: meet General Services Co., the firm that will do, build, get, buy or–if necessary–steal almost anything you need. Robert Heinlein, in his Anson MacDonald guise, makes his second appearance in this issue with his mildly amusing tale, “–We Also Walk Dogs.” I’ve lost count at this point, but this must be Heinlein’s 10th appearance in the magazine this year, and there are more to come. He was clearly Campbell’s fair-haired boy at this stage of the game, and his stories, both under his own name and his Anson MacDonald persona were clearly popular with the fans. But the crux of the story centers around an order the Company receives from the government which is quietly trying to arrange a conference between the intelligences of the solar system. The problem is to supply each race with the same kind of environment it is used to on its home world. Most of this is easily handled but the trick is how to alter earth gravity for those aliens whose home world has a lower gravity than that of earth. After hesitantly accepting the assignment, the staff members of General Services run through a series of interconnected contacts and trade-offs, the likes of which we’d later see in a M*A*S*H episode like “Adam’s Ribs,” Each deal depends upon the previous deal and at the end of the line is a physicist who can quite possibly solve the gravity problem. Indeed, he does solve the gravity problem and in the denouement there is some bickering with the government over who actually owns the rights to the gravity device the physicist invented. Heinlein comes across a bit more playful in this story than in some of his other works. It seems to me that this story in many ways followed the pattern of later Asimov stories–taking an idea to its ultimate conclusion. In this case, the idea was something simple, like a service you might call upon to do your taxes, and then generalizing that more and more broadly and abstractly until you wound up with something like General Services Company. The fact that there would be people out there that would use the service for seemingly outrageous purposes was a given–and indeed, we do see this today, although not as Heinlein predicted. Instead of one company that handles everything, we have dozens that narrowcast in specific areas so you can hire a maid service to clean your house; a pet sitter to watch your pets; a lawn service to trim your hedges. Heinlein’s humorous exaggerations poke some fun at the ridiculously wealthy, something that would likely be appreciated by a majority in today’s environment. Blurb: Brown was a robot, a minikin of a robot, but he had intelligence. And–a nasty sense of humor with respect to his builder. Long eventually bribes Brown into building a space-time rocket capable of a quick trip to Mars by “vibrating” there through the space-time continuum. The bride: Brown wants to go with him. The story is not a bad one, but to me, it seemed like filler that was needed to round out the issue. Heinlein clearly blew the other stories out of the water in this issue with most people rating his two stories first and second place. Most of the other scores seem pretty consistent and with the exception of de Camp’s “Stolen Dormouse”, I was pretty closely in line with the feelings of the fans of 1941 this time around. Two things of note for the August 1941 issue: first, of course, is part 2 of Heinlein’s “Methuselah’s Children.” Second is the next story in Nat Schachner’s space lawyer series which began last month with “Old Fireball.” I liked that story and I’m looking to the further legal adventures of Kerry Dale in “Jurisdiction”. And coming in the September issue are two stories I’ve been really excited about since this Vacation started: Isaac Asimov’s “Nightfall” and Alfred Bester’s “Adam and No Eve”. From the description, See Saw is indeed the first Weapon Shop story I read and remember. JWC probably used RAH a lot because he was fast, reliable, and needed relatively little guidance. That freed him up to “grow” some others like Isaac Asimov. I’m still trying to track down the CDS story, it doesn’t look like it is in any of the CDS collections I have, alas. “Spaceship in a Flask” has never been reprinted, so this issue of Astounding is its one and only appearance. Give Cliff three more years, and then his good stuff will start showing up on this vacation. This Golden Age vacation’s “Methuselah’s Children” is not the “Methuselah’s Children” you read 14 years ago. Just like “…If This Goes On”, Heinlein revised and expanded his text when it was published in book form in 1958. I have no idea what these changes were – apart from Mary Risling becoming Mary Sperling, since the name Rhysling was used for another purpose by RAH in the meantime. Hunh. I didn’t quite realize that, Mark. Mark, that’s interesting, especially about Risling. When I first saw the name, I thought, hey, is this the Rhysling?–but I didn’t notice the difference in spelling. Of course, that is part of what makes this Vacation fun: watching a writer evolve and improve. I’m told the same will happen with Leigh Brackett. I have not been impressed with her first two pieces that have appeared . Some writers, like Nelson S. Bond, are very mixed. Some of his stuff I really don’t like, and some of it is absolutely brilliant (I’m thinking of “Cold” in the latter case). Sadly, the Leigh Brackett that people love is not part of your vacation. Her elegiac planetary romances and Chandler-esque space operas were not published in Astounding but in the pulps Thrilling Wonder Stories and Planet Stories – in between her much more lucrative screenwriting gigs. Gifford’s book is well-worth the $29 investment.